Last night marked the exciting launch of The Artist Series – a new monthly installment from Roxy Cinema Tribeca! Bringing together the worlds of film, art and music, the program will showcase select artists and their new projects by the way of screenings, intimate Q & As and listening parties. To kick off the series, Roxy Cinema x The Black Lips hosted a screening of Song To Song – a new release from filmmaker and visionaire Terrence Malick. The film stars the band, Rooney Mara and Ryan Gosling, and follows a modern love story set against the Austin, Texas music scene. Two entangled couples chase success through a rock ‘n’ roll landscape of seduction and betrayal. Courtesy of Vice Magazine, Old Blue Last beer filled Roxy Cinema concession stand – and hands. 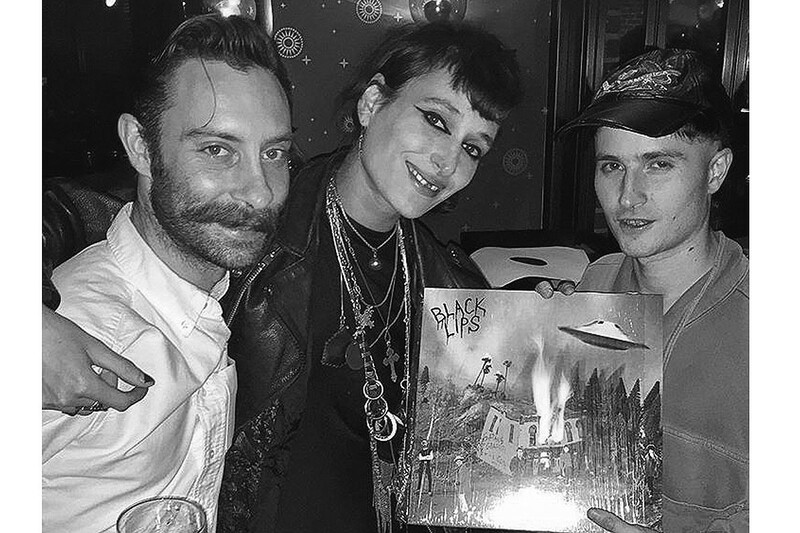 Post screening, The Black Lips and Cinema Manager, Illyse Singer took the spotlight to discuss the film and the release of their new album – Satan’s Graffiti or God’s Art? A packed cinema then moved upstairs to Roxy Bar where guests and fans alike were treated to an exclusive listening party. We caught the band for a quick catch-up on music & film before they had to turn the lights up and head back to their suite. ROXY CINEMA TRIBECA: WHAT ARE YOUR TOP TEN FILMS OF ALL TIME? The Black Lips: In no particular order: butch Cassidy and the Sundance kid, rivers edge, marjoe, blue velvet, apocalypse now, the life and times of judge roy bean, bad lieutenant, the battle of Algiers, cobra verde. WHAT IS THE FIRST MOVIE YOU REMEMBER SEEING THAT MADE A LASTING INFLUENCE ON YOU? HOW ARE YOU INSPIRED BY FILM? DOES IT AFFECT THE MUSIC YOU CREATE? WHAT ARE YOUR TOP 10 RECORDS OF ALL TIME? DO YOU THINK CINEMATICALLY WHEN YOU CREATE WORKS OF ART? Catch The Black Lips in concert at Webster Hall tonight. For more information, visit www.websterhall.com. For more information on upcoming Artist Series events and a full Cinema program, visit the Roxy Cinema Website here.